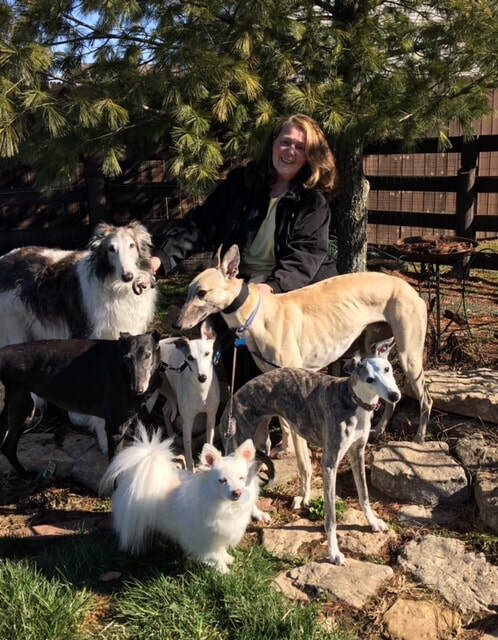 LL's Gabriel was in town for only a day when Colleen saw his photo on the website, she so misses her big red male, Cowboy, who she adopted from GAGC years ago and wanted to meet GABE and see how he did with her pack, Merlin, Lacie, Chaser and Gypsey. Gabe, now known as Morning Skii, did fantastic with all of them and warmed up to Colleen immediately! Her little black greyhound, Lacie was thrilled to have another greyhound in her family! This was meant to be!